solicitamos um depósito de 50% do valor total da estadia e que nos envie o comprovante para este mesmo email. O restante é pago no check in e pode ser em dinheiro e cartões de débito ou crédito à vista (VISA, MASTER e ELO). 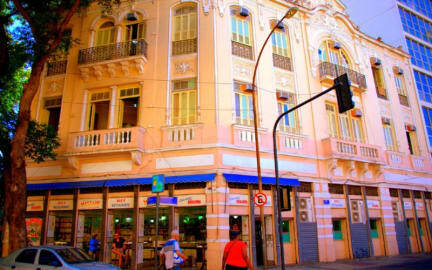 Massape Rio Hostel is located in the city centre of Rio, in the bohemian neighbourhood of Lapa. Quick access to bus stops and metro line. 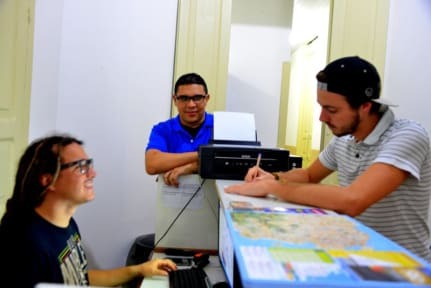 Massape Rio Hostel is an option for those travellers interested in the history and culture of Rio (Municipal Theatre, museums, bars and restaurants) and architectural (Lapa Aqueduct and Santa Teresa neighbourhood) side off the marvellous city. We are located to few minutes walking to bus stops and Carioca Metro Station, which theses provides to the traveller the easy access to the different parts of the city. Every room has balconies, air condition and free Wifi. Our hostel is a classical house with two balconied floors around the common areas to chill with a drink and a nice view of the neighbourhood. The rooms can be shared (4, 6 or 8 beds) or private bedroom. All chambers have balcony and air condition from 20 pm to 10 am. The Sheets are included. Every bed has a locker where you can put your personnel things and could to put a lock. If you like enjoy more the time in a hostel, we have a place with a balcony where you can drink cachaça free for the guests, watch TV, use the computers and relax in the sofa. We offer free breakfast, WiFi area, and bar services. Have a kitchen and one lounge room too. Our reception is 24 hours and our team is an international staff, so they can speak Portuguese, English and Spanish. We have information of principal tours of Rio de Janeiro, and the tips for those prefer to visit the places by themselves! Including the event’s guide daily actualized. Check in: 14:00 to 00:00.